Previous visitors to Orlando are bound to be familiar with the landmark on the 192 which is Bonanza Golf. 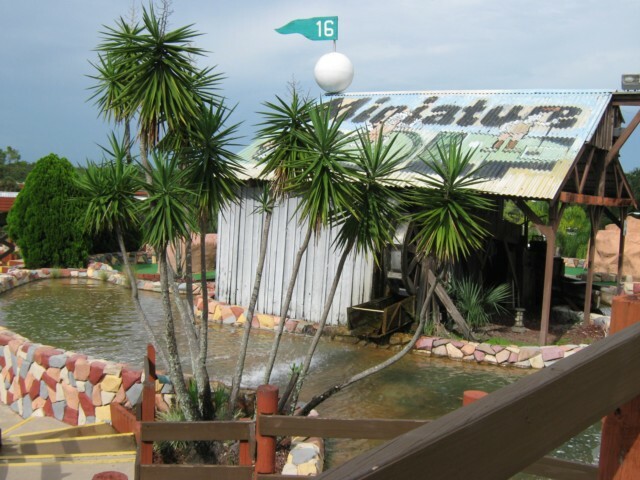 There is a large ‘mountain’ with cascading fountains, making it hard to miss but even though we have been going to Florida for many years we have never got round to playing crazy golf there. 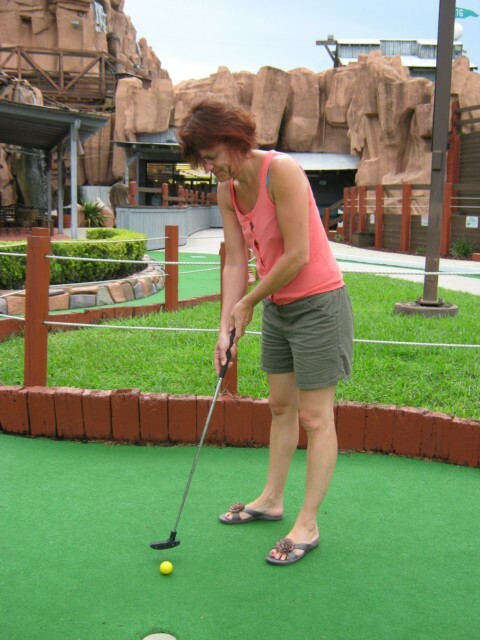 During the run up to tropical storm Isaac we had a free afternoon when it was a little dull for lying by the pool so we decided to play the course. It cost about $8 per person so was a little cheaper than some of the others, particularly the Disney ones. 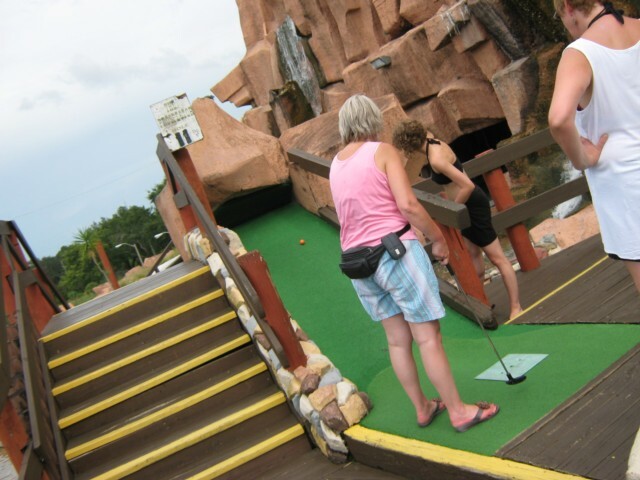 There are 18 holes on each of two alternative courses – Prospector and Golden Nugget, both similar with holes over three floors, some include drops where the ball comes on a lower level, most of the holes are Par 2 or 3 which we found reasonably fair – only one of our party of eight managed a hole in one! On the whole the course is looking a little tired with some graffiti but in general the waterfalls are very picturesque and avoiding the lizards was an addition hazard! The shop at the exit is also worth a visit for cheap Disney souvenirs and merchandise, whether you are playing or not. Some our party took a trip to Congo River Crazy Golf also on the 192, going past the I4, travelling East, Congo River is on the left hand side. In contrast to Bonanza, Congo River was slightly more expensive but if you visit the website first, reduced price coupons are available. This location also had two courses to choose from. We played the Livingstone Course which was quite challenging. Also as you go around you can play the ‘Exploration Game’ where you are invited to search for certain objects that are placed around the holes and you tick them off on your score card. Again the course uses three different levels of hole placements making a hole in one quite difficult as the ball drops from one level to another even though it inclines where extra power is needed. One of our party managed two hole in ones (what a show off! ) but at the end it was all smiles and good fun. We managed to find all the hidden objects around the course and all of our party received scratch cards as a rewards. These revealed $1 or $2 off your next game and some revealed a free round. We didn’t have time to try out the basketball game or go in the arcade or even feed the alligators! All in it was a good afternoon and we would definitely have returned for a return match but for running out of holiday time! ! Viewed 3329 times since 18 November 2012. Spaceship Earth - is it just a giant golf ball?